Within almost every mid to large-sized police department, investigative bureau or law enforcement agency, there's a group of men and women with elite training, equipment, and skills who get the calls no one else can handle. They go by different names: TRT (Tactical Response Team), SRT (Situational Response Team), ERU (Emergency Response Unit), SOG (Special Operations Group), and a host of other acronyms. The name may change, but the job—and the risk—of law enforcement's Special Weapons And Tactics teams stays the same, and some would say they're more necessary than ever. A good number of people who want to become a police officer have dreams of someday making it on the SWAT team, but few reach that goal. SWAT officers are in many ways the best of the best, and the requirements to make—and maintain your spot on—the team are quite stringent. With all the mystique and mystery, though, aspiring cops and curious citizens alike may often wonder just what the SWAT team does and what does it take to get SWAT ready? What Does the SWAT Team Do? In most cases, SWAT team members are pooled from the ranks of patrol officers, detectives, and even supervisors and sometimes command staff. These officers typically serve as SWAT team members as an additional duty to their regular jobs, so that SWAT is not a full-time career in itself. When the hot call comes, though, these officers respond as quickly as possible, ready to take whatever action may be necessary. SWAT Teams are called to handle situations that regular patrol officers and detectives and investigators aren't equipped or trained to handle. Typically, they respond to high-risk calls, such as serving arrest warrants on potentially violent suspects, executing search warrants in significant drug and other contraband cases, hostage rescues, and bringing barricaded suspects into custody. 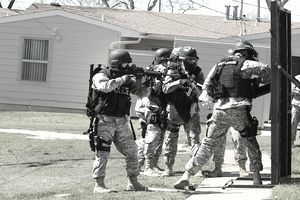 Traditionally, SWAT teams served as the primary response to active shooter situations; when these situations occurred, officers would create a perimeter and wait for the SWAT team to make entry. As those situations have proliferated in recent history, police are no longer waiting for SWAT and are instead developing training and tactics to eliminate the threat as quickly as possible to minimize casualties. SWAT teams still play a tremendous role in these and other situations, though, and their jobs are immensely dangerous. They're called to respond to the most volatile situations, including riots, high profile rescues, and even dignitary protection. The one thing SWAT teams do more than anything else, though, is ​to train. As you can imagine, the nature of the job of a SWAT team requires a high level of cohesion, expertise, and precision. For that reason, SWAT teams spend a great deal of time each month training and honing their skills so that they're ready to respond and perform on a moment's notice. What Is SWAT Team Training Like? Training for the SWAT team is intense, requiring a great deal of physical and mental exertion. Team members participate in intense physical exercise together, often in full duty gear to acclimate themselves to the real world conditions they may face. They also spend time training in special tactics, such as building entry and searches, doorway breaches, takedowns and search and rescues. Each member of the team has specific skills, duties, and responsibilities that they train on individually, as well as putting them together with the team. These may include jobs such as snipers, chemical agent specialists, less-lethal and nonlethal weapons like rubber bullets and bean bags, shotgunners, grenadiers, entry teams, and medics. What Kind of Equipment Do SWAT Teams Use? SWAT team members are among the best-equipped members of any police department that employs one. Equipment used by SWAT team members include flashbangs (a special grenade designed to disoriented and stun, rather than hurt or kill); tear gas; high-powered sniper rifles capable of ranges of a mile or more; non-lethal ammunition; sub-machine guns such as MP5's and UMP's; ballistic shields; special utility uniforms; ballistic helmets; breaching tools; and even armored vehicles. What Does It Take to Make It on the Swat Team? First things first, you have to become a police officer. In most departments, once you've completed the police academy and the field training program, you will likely be eligible to try out for a specialty unit—like the SWAT team—after two years of road patrol experience. To make the team, you need to be in top physical condition. You'll be put through a battery of intense physical fitness assessments to make sure you're capable of facing the tremendous demands that will be placed on your body and your mind. You'll also need to demonstrate weapons proficiency and the ability to think quickly and act as a cohesive member of a highly specialized team. If you can cut it physically, you'll undergo basic SWAT training that will push you to the limits and provide the skills you need to be a successful member of the team. Is the SWAT Team Right for Me? As we've discussed, SWAT training is intense, and the job is extremely mentally draining. You're subject to call-outs at any hour, and the requirements are demanding for even the most physically fit. SWAT teams demand mental toughness, a willingness to show tremendous courage in the face of extreme danger, and the ability to react to situations and take orders without question immediately. You need to be able to work very closely with others in a team setting, understand your role and execute it with precision, and above all, you must be ready and willing to make the ultimate sacrifice if it means saving the life of another. Serving on the SWAT team isn't for everyone; it's not even for every officer. But for those who can hack it, it can be an amazingly rewarding and exciting job.